Lock in a great price for Westminster Hotel & Spa – rated 8.6 by recent guests! Everything: the hotel common areas, the room, the spa, the bar, the restaurant... Beautiful, tasty, the staff was lovely. The suite had a very nice view of the sea. Loved the little balcony and the automated blinds in all windows. Room and bathroom was very clean . Staff were very welcoming and helpful. The hotel has a good location and is right on the water! Our room was clean and the staff was friendly. 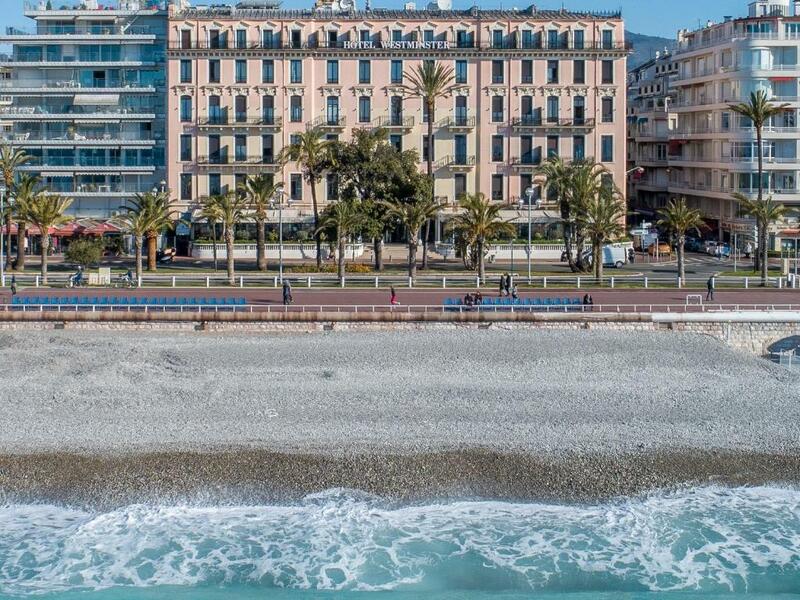 Overall a good place to stay in Nice! Great location but reflects the past in its facilities and attitudes. Rooms, building, comfort, Restaurante, spa ... and a threat location see front and next to city center . We loved the location. The staff were friendly and helpful. The room was clean and comfortable. Amazing view from our second floor suite. Shops and buses nearby. 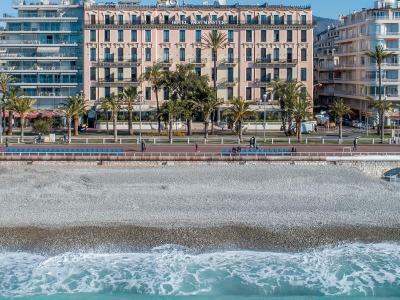 One of our top picks in Nice.Located in the heart of Nice, on the Promenade des Anglais, Westminster Hotel & Spa features a spa, a private beach and seafront terrace. 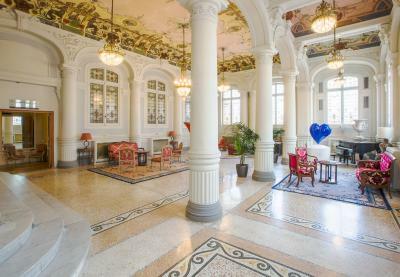 The hotel is decorated in a Belle Epoque style and offers both a bar and luxury lounge areas. High-speed wired internet access and free WiFi are provided. 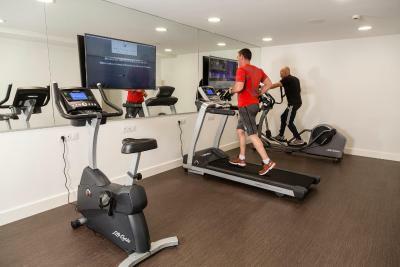 There is also a fitness center that guests can use free of charge. Guest rooms offer contemporary décor and are equipped with a flat-screen TV with free access to satellite channels and videos on demand. There is also a desk, a telephone with a direct line and voice mail, and an electronic lock and a safe. The air conditioning and heating systems are individually regulated in each room. Private bathrooms are marble or design concept and are equipped with a bath or shower, hairdryer and welcome products. A mini-bar is available and is at an extra charge. 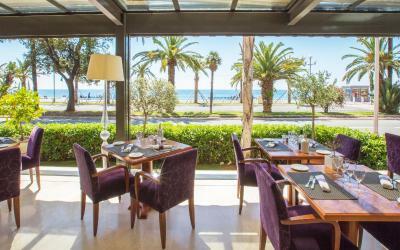 Restaurant Le Duc serves Mediterranean specialties which can be enjoyed on the hotel’s terrace, overlooking the Promenade des Anglais and the sea. 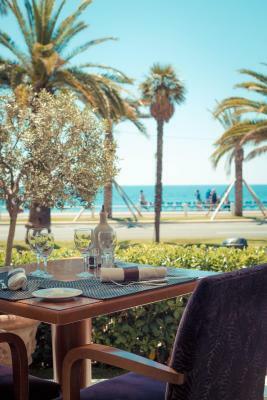 A buffet breakfast is served daily and can be taken in the guestroom or on the terrace. Guests can enjoy a drink in Bar Le W, which also offers a terrace. Seven meeting and reception rooms are available at Hôtel Westminster. The SPA 27 offers a 1312 ft² a relaxation area with a sauna, steam bath, hot tub and counter-current swimming pool. There are 3 beauty treatment rooms, and guests can enjoy herbal tea or a fresh drink. 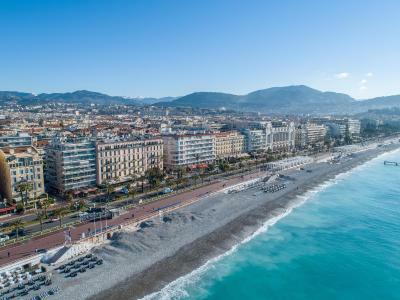 The hotel is 15 minutes' drive from Nice Côte d'Azur Airport and only 14 minutes' walk from Nice-Ville train station. 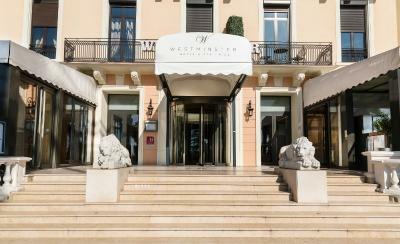 When would you like to stay at Westminster Hotel & Spa? 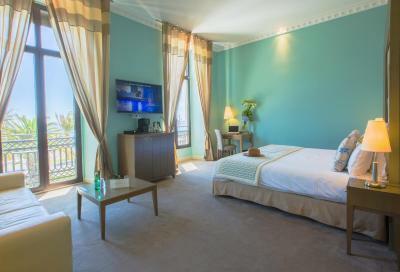 These individually decorated rooms offers city views, satellite LCD TV, free high-speed internet access and a mini-bar. The marble or designer bathroom features a hairdryer and free toiletries. Allergy-free pillows are provided. Some of these rooms have views of the surrounding hills. This room can accommodate a baby cot. 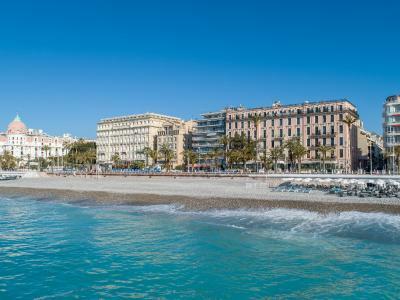 These spacious suites have views of the sea and the Baie des Anges. They offer a lounge area with a sofa and armchairs, a mini-bar, a satellite LCD TV, air conditioning and allergy-free pillows. 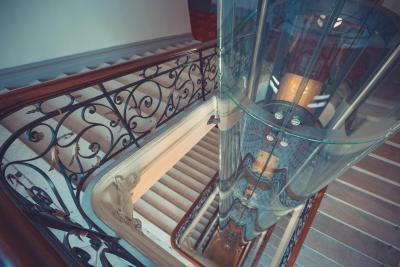 Luxury products are supplied in the marble or design bathroom with bathtub or shower, hairdryer, bathrobe and slippers. This room can accommodate a baby cot or an extra bed. A 1-hour free spa access can be enjoyed per person per stay, if booked in advance. Please note that this free access is subject to availability. Features a seating area with sofa and armchairs. 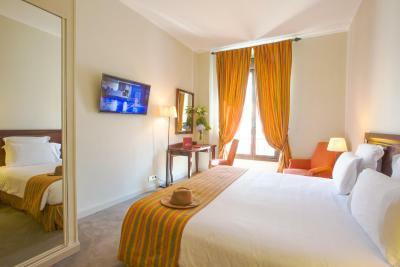 The spacious suites include a luxury, marble bathroom with bathrobe, slippers and Fragonard toiletries, a satellite LCD TV, a mini-bar and free, high-speed internet access. The pillows are hypoallergenic. 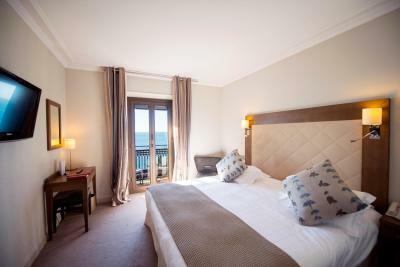 This suite can accommodate a baby cot or an extra bed. 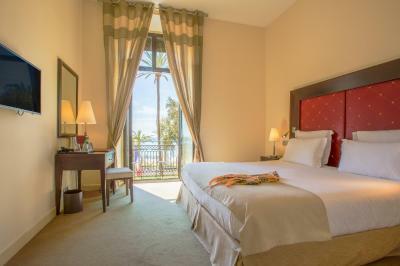 The superior room has a view of the sea and feature air-conditioning, free high-speed WiFi and a large flat-screen TV with a free video on demand service. There is also a mini-bar, a safe, ironing facilities and a courtesy tray. The bathroom has a hairdryer and a magnifying mirror. 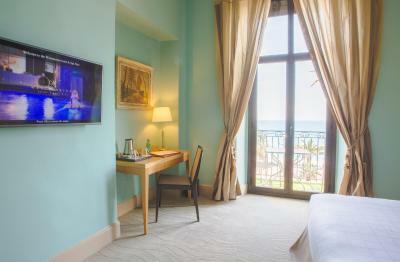 This spacious suite faces the beach and offers a balcony with sea views. It has a separate living room with a sofa bed and a flat-screen satellite TV, soundproofing and a mini-bar. There is an additional flat-screen TV in the bedroom and the pillows are hypoallergenic. 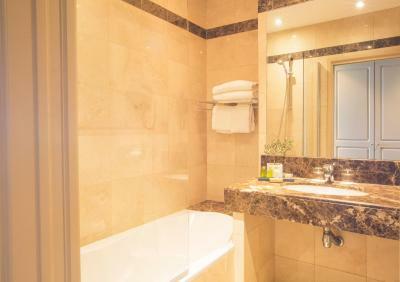 The large bathroom, illuminated in natural light, has a bathtub and a separate shower, a hair dryer, bathrobes, slippers and comes with Fragonard products. Price based on 2, but maximum occupancy is 4 (see policies). 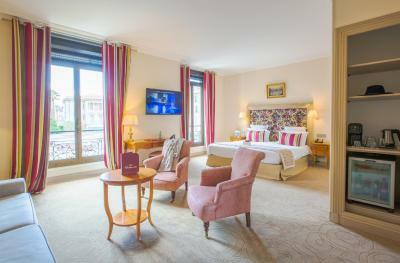 Offering a city view, this spacious and bright suite includes a separate living room with sofa bed and a dressing room. 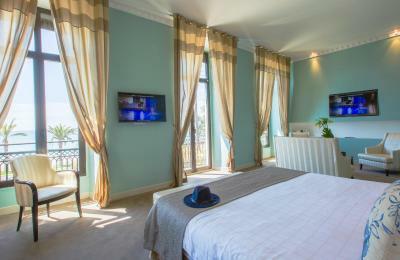 It offers 1 satellite flat-screen TV in the bedroom and 1 in the living room. The pillows are hypoallergenic. The large bathroom, illuminated in natural light, has a bathtub and a separate shower, a hair dryer, bathrobes, slippers and Fragonard products. This non-smoking room offers free WiFi access, a flat-screen satellite TV, a telephone with voice mail, a mini-bar and an individually-controlled heating and cooling system. Hypoallergenic quilt and pillows are also provided. 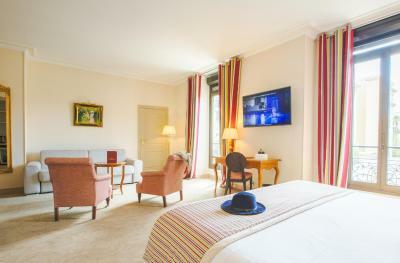 This room features a view on the Baie des Anges. It offers free WiFi access, a flat-screen satellite TV, a direct-dial telephone, a mini-bar and an individually-controlled heating and cooling system. Hypoallergenic quilt and pillows are also provided. 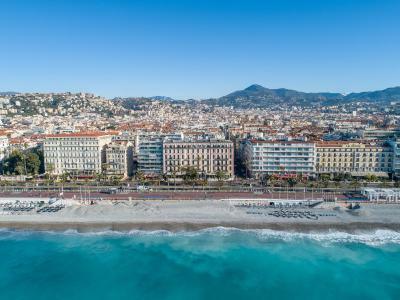 Welcome to the Westminster Hotel & Spa Nice, a new universe dedicated to the pleasure of the senses located in the heart of Nice and facing the sea. New SPA 400 sqm, new restaurant and bar. Sea view air conditioned terraces. 99 rooms , junior suites and suites. Close to the pedestrian streets and the city center . House Rules Westminster Hotel & Spa takes special requests – add in the next step! Westminster Hotel &amp; Spa accepts these cards and reserves the right to temporarily hold an amount prior to arrival. Westminster Hotel & Spa accepts these cards and reserves the right to temporarily hold an amount prior to arrival. Please note that the property will send an email after reservation with payment instructions. Guests will be invited to make payment via a secure link. Please note that the credit card used to make the reservation, for the prepayment or the deposit and a valid ID must be presented by the holder upon check-in. Please note that use of the private beach requires payment of an additional fee. 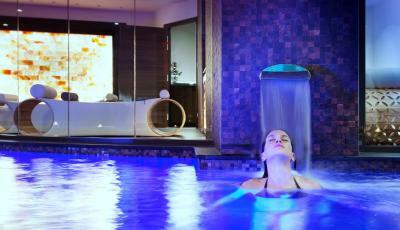 Access to the spa begins at a price of EUR 30 per person. Please note that access is prohibited for children under the age of 16 years old. Please note that when booking 3 rooms or more, different policies may be applied. Please contact the property for further details. 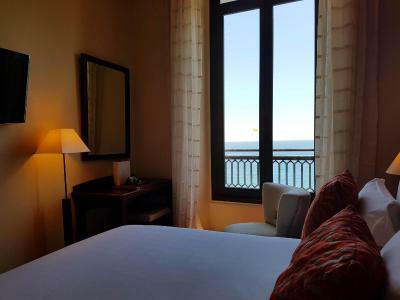 When booking a room with sea views, a 1-hour free spa access is offered per person per stay. Larger tv with English options. Ocean view room and on site bar and restaurant. A little overpriced. No parking from the hotel, neither price agreement with nearby parking. Some staff not helpful. Some staff ok. Location and sea view room! 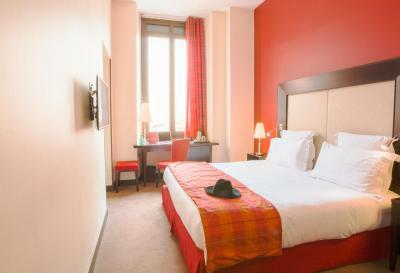 The rooms are pretty basic, large rooms with very small tv screens - but still comfortable and clean. The iron we had in the room was terrible and leaked water everywhere. The importance of customer service is essential though and with my partner being Gluten Free, our first experience during check-in was poor. The lady not only appeared to find it amusing my partner had Gluten Free requirements, was rude but also said they had no options for breakfast (this proved to be incorrect and clearly the front desk staff need training in what they do/don’t have- they can prepare gluten free bread for breakfast etc) - this caused upset to my partner before we had even got into our room. Overall a good hotel but has improvements to be made. Great location and facilities overall were good. Restaurant and bar a bit souless. We ate at the restaurant next door. Plumbing a bit dodgy and some sockets didn't work. There is not a room service menu in the room. When I called room service by phone, I was informed about very few plates that they could offer. It seems they don't like to serve dinner in the room, what is real disappointing in this level of hotel. Anyway, we decided to try the restaurant. It was another disappointment. As my husband was feeling a little bit sick, I asked to prepare a simple "al burro risotto" (much easier to prepare than the risotto indicated in the menu). The waiter told me it was not possible, as they have the plates already organized (!). For me it means they don't have a chef of cuisine. And finally, the risotto (from the menu) arrived not hot, just warm (a real sin in the universe of risottos!). Excellent position! 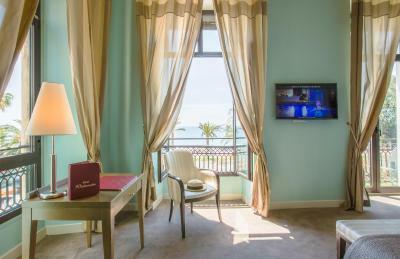 The sea view room is a wonderful experience. Confortable bed and pillows, Coffee and tea machine in the room. The pressure of water in the shower is very good (not a common thing, even in good hotels). Public parking located just around the corner, few steps from the hotel. You can stop the car in front of the hotel (to have a help with luggage) before going to parking. Spa swimming pool was denied to our 4 year old toddler. Huge disappointment. Room service usually had only one or two items available from their menu. Ordering from outside ( Ubereats) was very rudely discouraged by bellboy. Well, make sure that your room service is upto the mark then! Reception staff were helpful and friendly as were restaurant staff.